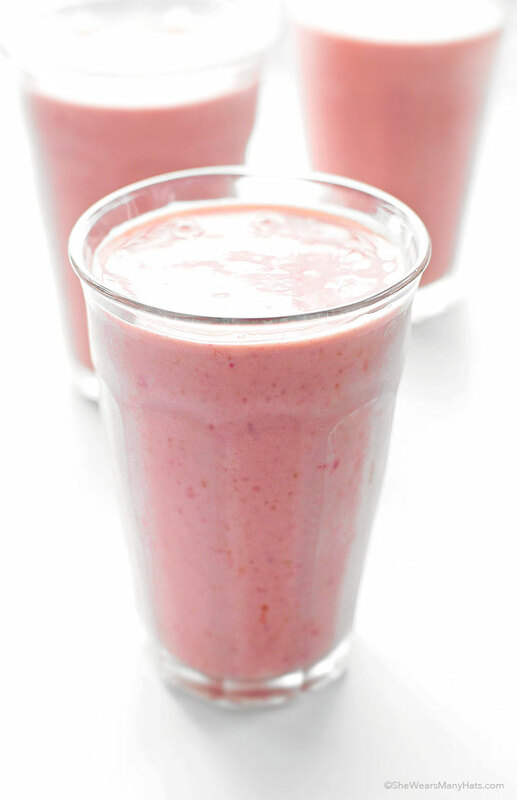 Start your day with a nutritional and delicious Strawberry Oatmeal Smoothie. These days it seems that you can find a smoothie shop on just about every corner. As easy as they are to make, why not make them right at home? Not only can you create your own favorite flavor combinations, you can know exactly what is being put in your smoothie. So no need to worry about preservatives or other weird stuff being added. Smoothies have become a regular favorite in our home, and not just for breakfast, or a snack. Frequently we prefer a smoothie for a lighter lunch or dinner, espcially when on the go. 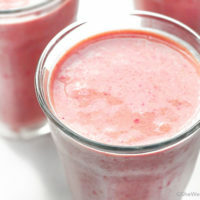 This Strawberry Oatmeal Smoothie is just one of the smoothies that we find perfect for any meal. 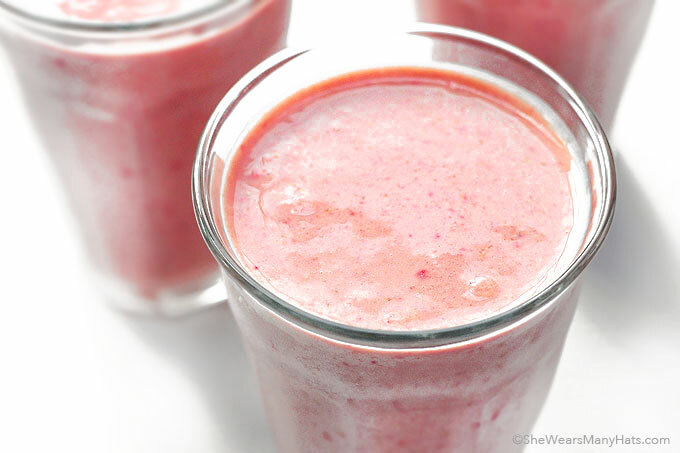 Not only is a Strawberry Oatmeal Smoothie a nutritious option, but it’s super easy too. 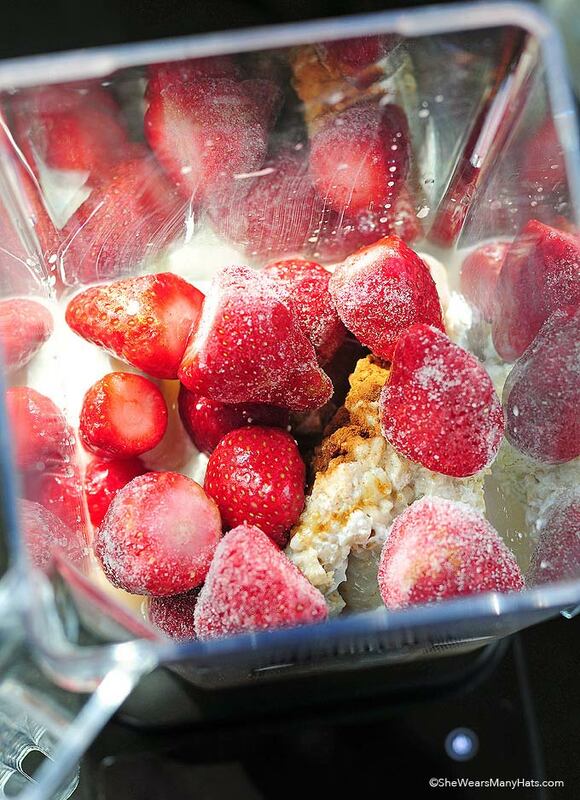 Blend frozen strawberries with cooked old-fashioned oats, greek yogurt, brown sugar, ground cinnamon, vanilla and a bit of water until smooth. Pop in a straw and enjoy! If you regularly cook oatmeal for breakfast, just make a little extra to save for using with this smoothie recipe. Add the leftover oatmeal and a few other simple ingredients that are easy to keep stocked up. We stock up on frozen fruit which makes it easy to make smoothies any time the craving hits. Plus a touch of cinnamon adds just the right amount of spice to mingle with the oatmeal and strawberries. Just toss all ingredients in a blender, give it a whirl until it’s smooth and ready to sip right up! 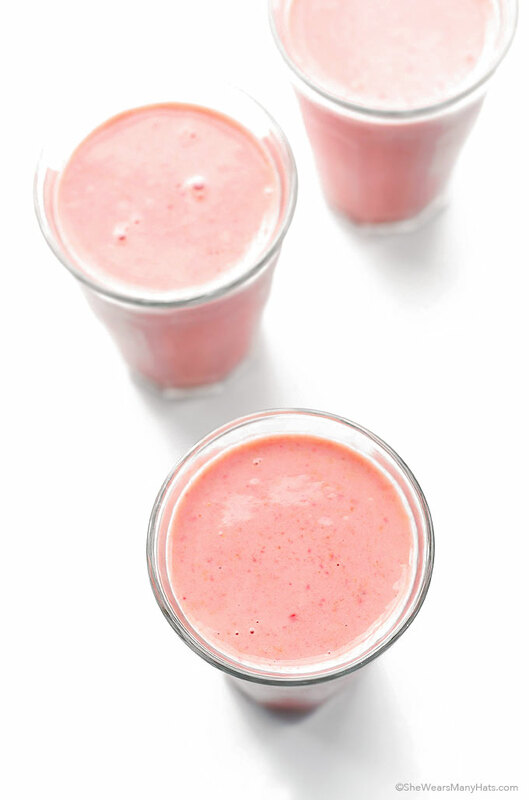 The perfect smoothie for breakfast, lunch or a healthy snack. This will start my day off right and is a perfect to whip up right before running out the door! 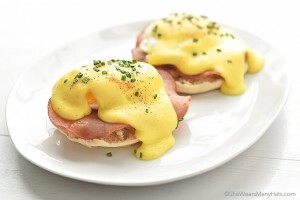 I wish you could be at my house tomorrow morning to make this for me. It looks so good! This looks super simple and yummy! I love a great smoothie, and you’re right-why not make it at home! Thanks for posting this, can’t wait to try it. Perfect way to start any day! This is gorgeous! I love this. I am a big fan of all-the-time smoothies, and adding leftover oatmeal is a wonderful way to get them extra creamy. Made this for my mom and I this morning-so yummy! Will be sharing the recipe! So glad y’all both enjoyed it! I think I need to go fix a batch for us too. Sorry to be a spaz but you need to cook the oatmeal before making the smoothie? Nevermind answered my own question, duh! Can’t wait for fresh summer strawberries to use in this one! Looks delicious! Plz lemme know how do i cook the oats before adding in th smoothie? According to the package instructions. It is just me so when I mix this up will it keep in the refrigerator for a few days or should I cut the recipe down for just one serving? I would make enough for one serving. Hi. Can I use steel-cut oats? I also would like to know this! Started going through the comments looking for this exact answer! How many calories is this one? Have not tried it yet I think and feel that uncooked oatmeal will be just as nourishing than cooked oatmeal yes adding less to the blender perhaps about a quarter cup. You are right about blending it uncooked; and it tastes just fine. I would replace the brown sugar with honey (from local hives if possible), no cinnamon, and add almond milk or coconut milk. Is that the steel cut or just regular that you can just blend first? What does 12 ounces in weight does strawberries equal in measurements? About 3 cups of whole strawberries. Sounds like something we need to try!